James Collins was born in Exeter, U.K. 1984, and moved to Perth, Western Australia with his family before he was three. He began learning guitar with the late Andy Hassan at nine and made his first public appearance in the same year. From school, James began a Bachelor of Music degree at the University of Western Australia under the tutelage of John Casey. 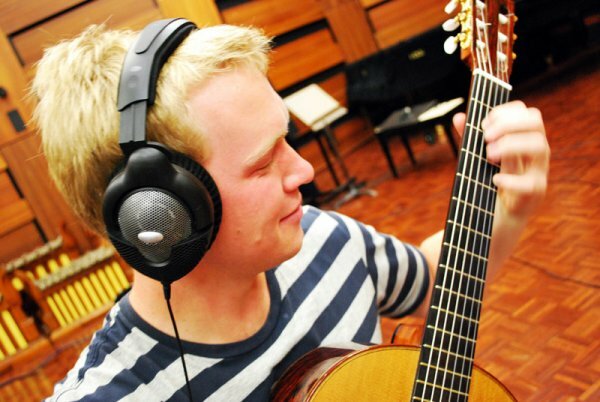 After winning the prize for the highest performance mark in the University of Western Australia School of Music, James moved to Manchester to take up studies at the RNCM with leading guitarist Craig Ogden, where he was awarded the Royal Northern College of Music Overseas Governor’s Award. It was at the RNCM that he met the Irish composer Michael Doherty, who has collaborated with James in the six orchestral tracks of this recording. James has performed extensively on the guitar and lute throughout England, as well as Scotland, Prague, Vienna and Australia, both as soloist and chamber musician. As this CD is released, James is residing in Perth, and is also taking work as a recording and mixing engineer.